Oscar shortlisted documentary is almost certain to be one of the final nominations. It as won a ton of awards including our own Unseen Film Award for Best Documentary. It is a film that will delight you from the first frame to the last. 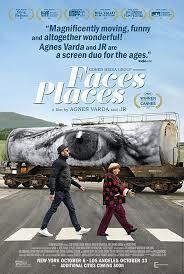 The film is simple, directors, legendary artist and filmmaker Agnes Varda and artist JR travel around France meeting people and occasionally pasting large portraits of them on the side of buildings, rail cars or whatever happens to be at hand. Its a charming series of road trips that make you fall in love wit not only the filmmakers, who are the protagonists of this crazy show, but also the people who they meet along the way. Never as a film made me want to travel to France as much as this one. I don't know what else to say other tan see this film because in a world so full of terrible things here is a film that celebrates the good tings in people.